Can I keep my worm bins in a garage that gets quite warm on hot summer days? Also, would they freeze in an unheated garage during the cold Maine winter months without some kind of added heat source? I plan on using 18 gallon Rubber Maid containers to start up with....Any answers or ideas would be greatly appreciated..Thanking you in advance. Richard Spencer, Green Lake, Dedham Maine. Keeping composting worms, and it depends on which species you're raising, but with most once the temperature gets above 90*F (32*C) for long periods of time can begin to affect your worms. 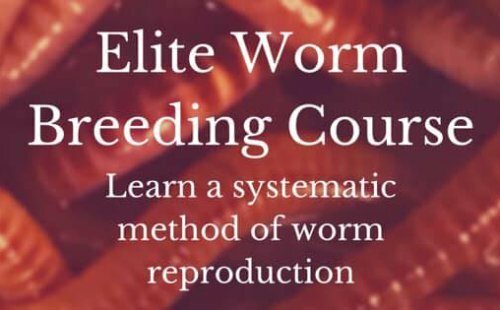 The Book, The Worm Farming Revolution, has a chart for 6 species of worms with all of their ideal temperature ranges and temperments plus more on their characteristics. It's a pretty cool chart that you can print out and reference from time to time. 90*F will not harm the worms IF they have plenty of moisture and air flow. The evaporation will keep the system cool enough but you'll need some slow moving air (like a fan) for air circulation IMO. Keeping the food supply mostly carbon will help greatly in keeping the temperature down as the nitrogen source foods can heat up slightly and is harder to keep aerated without mixing it into the carbon bedding well. You could setup a hose that pumps cool air into the bins from your house but that is getting extravigant. Many garages get in excess of 100*F (37.7*C) or more and this is simply too hot for composting worms and your squirm will suffer and most likely die off. African Nightcrawlers & Red Wigglers will handle 90*F okay but understand that they mostl likely will not thrive and go into a bit of a survival mode (no mating and not eat as much). If kept outside in 90*F temperature in the shade then this is well within their liking, just monitor moisture and humidity. A lot of problems can be avoided by keeping the C:N ration at 20:1 - 40:1 or around there but in the winter you'll want to raise the ratio with higher Nitrogen. Now as for the winter in the garage, if temp is below freezing, you'll just want to keep some type of insulation around the system in order to trap the heat in. Again, raising the amounts of nitrogen is helpful as this will increase the temperature. Make sure to keep the system moist at all times. Don't lock in the air though. You still need some ventilation but only very little. I've created a helpful page for beginners and experienced Vermicomposters. Go to the page below read it and print out the PDF "Cheat-Sheet". Some people still struggle because they do not know the 5 fundamentals of Worm Farming.